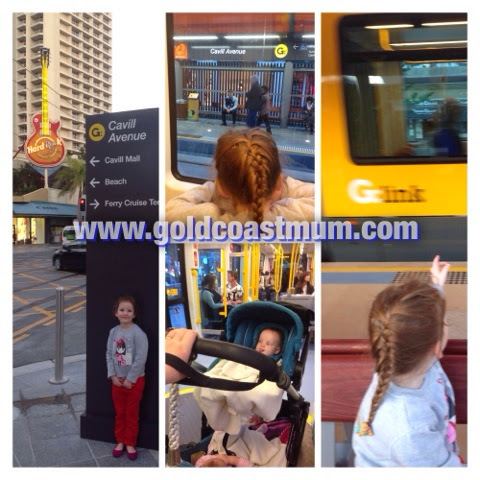 Yesterday Miss 4 & I, along with the twincesses (now 8-months), decided to try out the new Gold Coast Light Rail - officially called the G:Link. Hubby & I decided against taking the whole family to join in on the fun on Sunday when it was free travel for all - due to the large crowds. 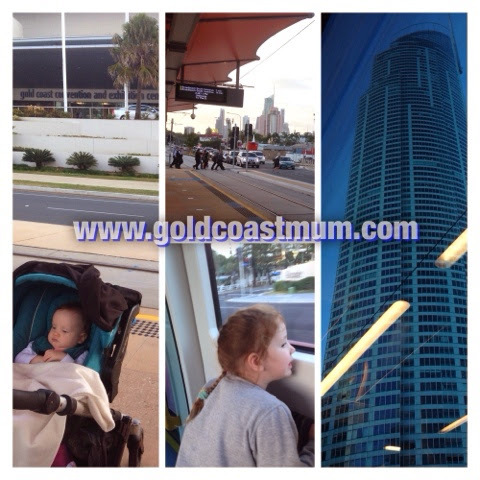 So yesterday (Monday) as part of our weekly 'girls' day' when Miss 4, the twincesses & I do a fun activity, we headed to Broadbeach to enjoy a tram adventure. I parked in front of the shops opposite the Gold Coast Convention & Exhibition Centre. After paying $3 for parking there, Miss 4 held hands with me (as I also pushed the double pram with my other hand) across the road to the Broadbeach North G: Link stop. A tram was approaching so I quickly tried to purchase a ticket at the machine but unfortunately it wasn't recognising my credit card or eftpos card. So that tram came & went. I made a few more attempts then let others in front of me to try to pay when a second tram approached just a few minutes later. When I had finally given up on paying by card I managed to find some cash after rummaging around in the depths of my handbag. But then.....The machine would not accept my $5 note or $1 or $2 coins to pay the $5.20 single adult fair (for zone 14). Despite many attempts, it kept spitting my coins back. A repairman was working on the only other ticket machine on the platform & offered me a $1 coin of his to try. But no luck unfortunately. So when the next tram arrived, the repairman suggested I just jump on board and explain the situation if anyone was to ask. I took his advice as I only had a limited time for our tram ride & to then get back to the car before my parking ticket expired. Miss 4 & I boarded the tram, with the twincesses in the pram, with ease & got comfy as we looked out of the window & around the shiny new tram. 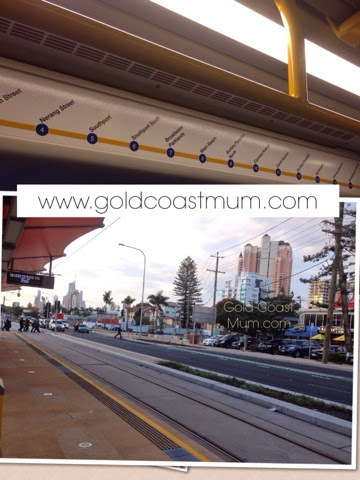 Our trip into Surfers Paradise was super quick & comfortable. We hopped off at the Cavill Ave stop & crossed over to the other side of the track for our return journey. Thankfully the ticket machine there accepted my cash to pay for a ticket. 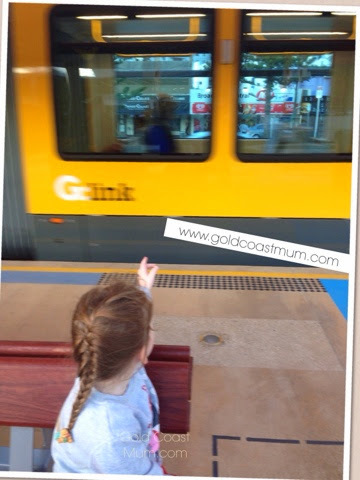 Miss 4 was fascinated by the rails in the road & loved the seats on the platform. 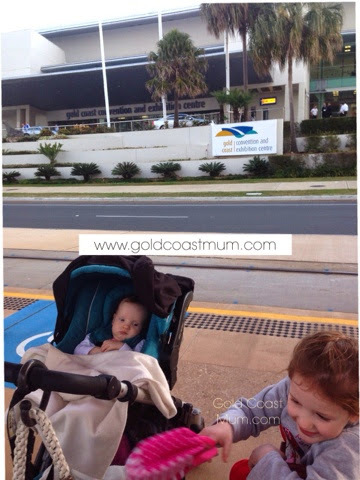 After a speedy return trip to Broadbeach North, we made it back to the car with one minute to spare before the parking ticket expired. Phewww! I hope it will be a huge success on the Gold Coast. Navigating the roads, tram line & boarding & exiting the tram with my double pram (Strider Plus) was simple - though the tram doors didn't automatically open for me to board - I had to walk in front of pram to press a button on the tram door for the doors to open. I look forward to our possible next adventure when we might take the whole family on the tram to experience more of the route - perhaps over the bridge to stop off at Southport Broadwater Parklands. Have you travelled on the G? Will you use it? Sounds like a great adventure, ticket machine dramas aside.